In the spirt of the Holiday season, the Michigan Aggregates Association (MAA) has once again partnered with the US Marine Corps Reserve and the Toys for Tots program to help reach their primary goal of delivering a message of hope to less fortunate youngsters. By donating a new toy at Christmas, MAA will assist children in becoming responsible, productive, and patriotic citizens. This is the second year MAA has designated Toys for Tots as the association holiday charity. Participants include aggregate producers along with the equipment manufacturers and service providers (responsible for the production and delivery of essential raw materials used in our homes, buildings, roads, bridges and public works projects). During the 2018 Michigan Aggregates Association Winter Conference a message of hope will be sent by providing an unwrapped toy during their Winter Conference. The official presentation of toys to the US Marine Corps will take place December 6, 2018 at 8:00pm at the Westin Book Cadillac Venetian Ballroom. To help with the collection of toys, MAA has a number of donation boxes ready to be deployed to member companies. If you would like a box for your office, please contact the MAA office and make arrangements for delivery. 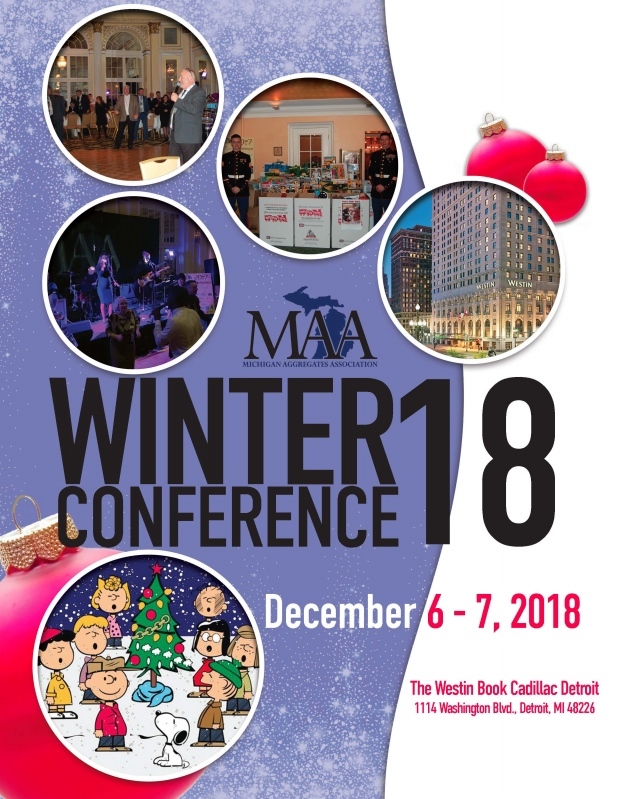 Registration is now open for the 2018 MAA Winter Conference. This years theme is – A Charlie Brown Christmas! We kick off the evening with a welcome reception at 7:00 pm on Thursday, December 6, 2018. Dress is a suit and tie for men and evening/cocktail dress for the women. No formal attire required. Toys for Tots again is in full swing again this year so upon your arrival on Thursday night, you will be asked to place an unwrapped toy in a box marked “Toys for Tots”. MAA has made arrangements again this year for a visit from the U.S. Marines during this event to gather the toys for children in need. By popular demand the Simone Vitale Band will keep things moving on the dance floor. Friday morning will start with breakfast in the Venetian Foyer followed by an MAA update and other insightful speakers. So hurry and register for this years Winter Conference to make sure you attend this once a year and very memorable event. Early registration price ends November 23, 2018. Click here to download the pdf file of the registration brochure. If you have any questions, please contact Juanita at the MAA office jpatson@miagg.org or 517-381-1732.